Howdy, howdy, howdy everyone! Can you believe it’s just 10 days until Christmas? 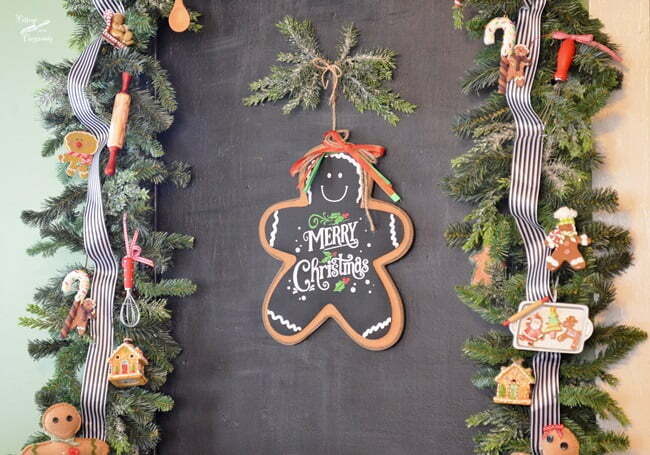 Today I’m sharing our Gingerbread kitchen with you. 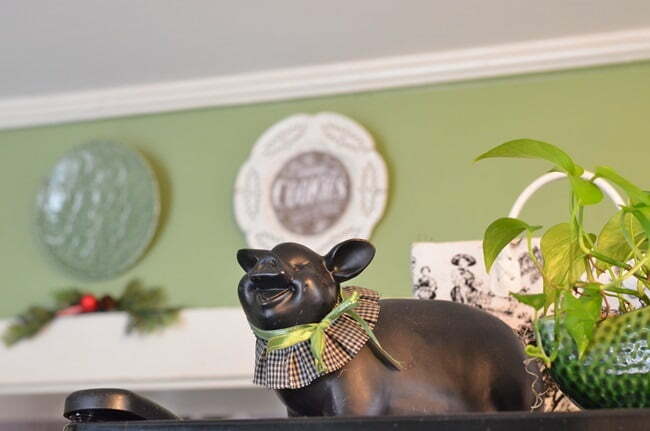 Our kitchen here at the Crossroads is old and small, but it’s one of my favorite places to decorate for the holidays. 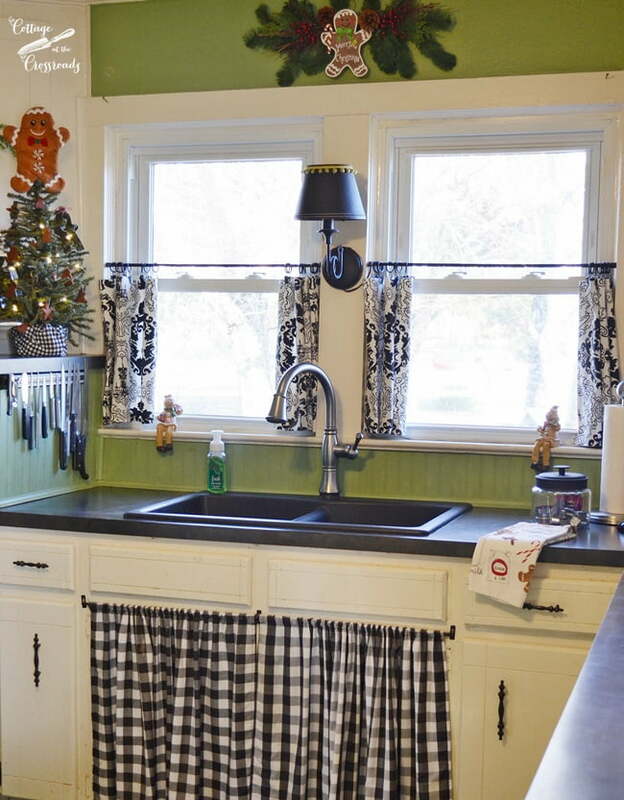 Do you decorate your kitchen for Christmas? Obviously, I do but here’s my reason for doing so. To me, the kitchen is the heart of the home, and most of my memories of past Christmases revolve around the food that comes out of the kitchen. The warmth, the aromas, the coziness all emanate from the kitchen. Nothing shows love more than homemade goodness from the kitchen! 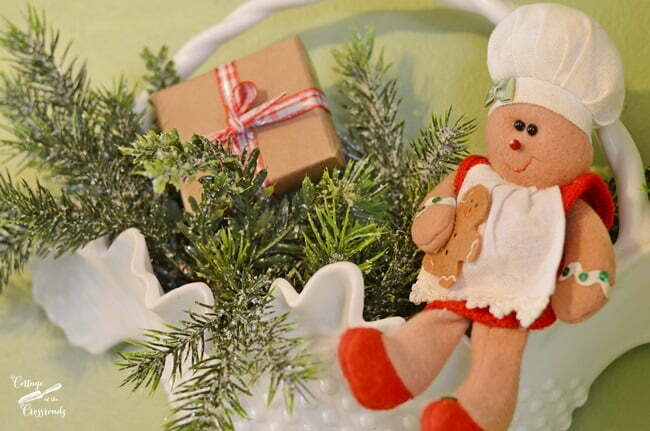 And what can be more whimsical and full of fun than gingerbread people! About 5 years ago, I started collecting gingerbread related items, and nothing you see here is new. Most all of it has been rearranged or displayed differently. Oops! I forgot. 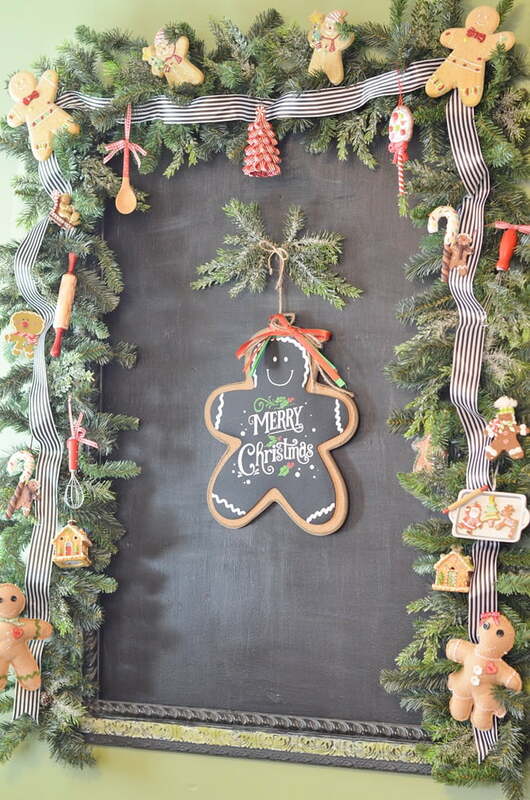 The wooden gingerbread boy hanging here on the chalkboard is a new addition this year. Here’s a closeup of some of the ornaments hanging on the garland. I’m just like a kid again when I bring them out of storage each year! 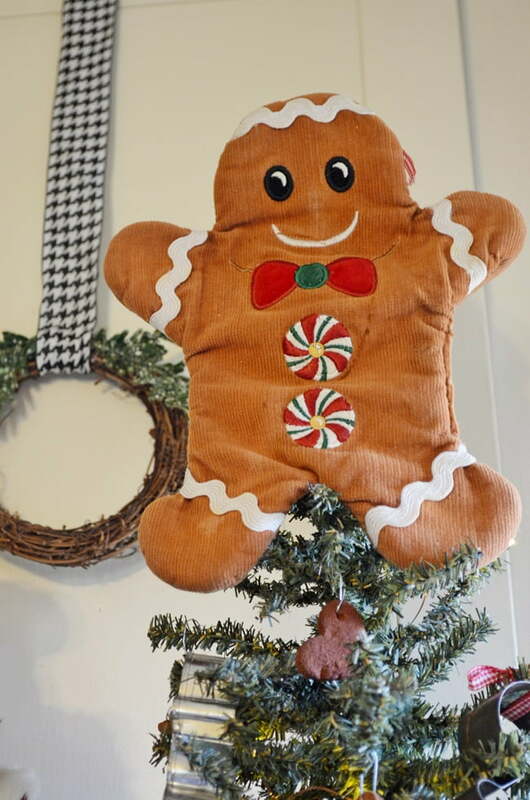 I made this little guy last year, and if you’d like to make some of your own, you can find the directions in this post: Handmade Gingerbread Boys and Girls. You can’t help but smile at such cuteness, can you? In the corner are more gingerbread decorations. 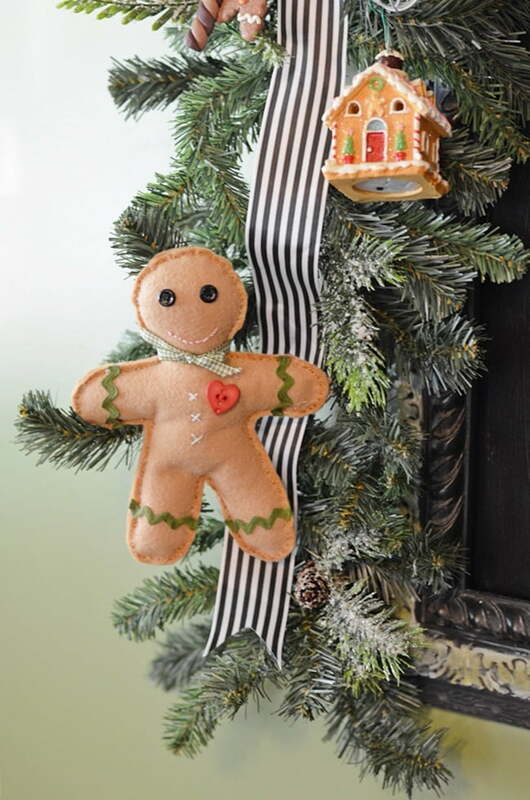 In this little wall pocket is a cutie with her gingerbread dolly! It was this gingerbread house that started all of this. I spotted it in a shop and fell hard. Luckily, it was on sale! Pork Chop is still residing on top of the refrigerator. Now, I have to admit something to you. See the white plate in the background? I forgot to take off the “cookies” sign (it’s just a printed piece of paper) last year, but I did not realize it until just a few months ago! So I just left it up until Christmas rolled around again! Above the stove is a shelf with more gingerbread goodies. You may recall that I made this stenciled sign last year. 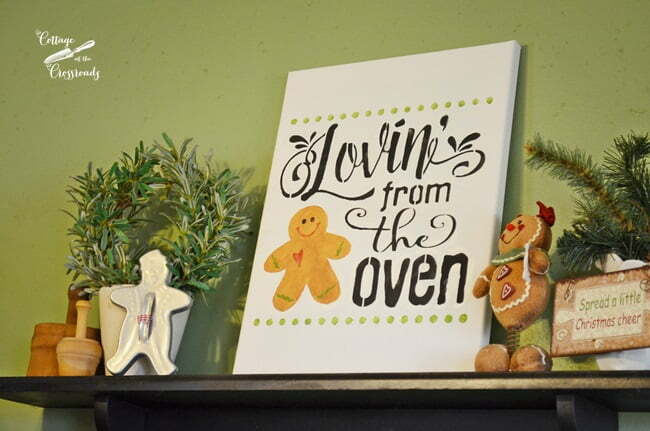 You can read more about how I did it in the post New Gingerbread Kitchen Sign. 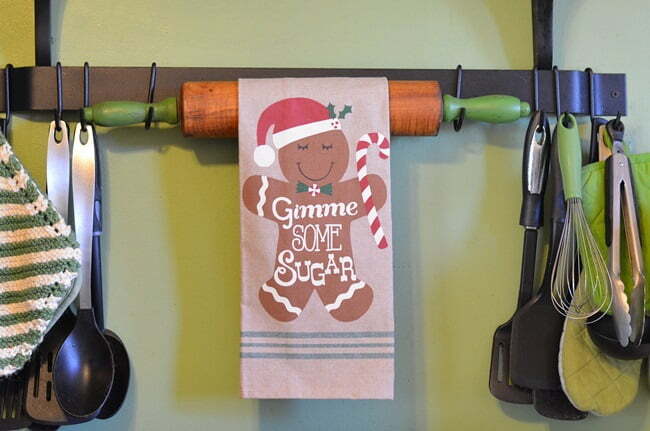 I’ll be asking everyone to “gimme some sugar” just like it says on this cute kitchen towel! Hanging on the stove handle are some kitchen towels that I picked up last year, but I don’t think I ever showed them to you. 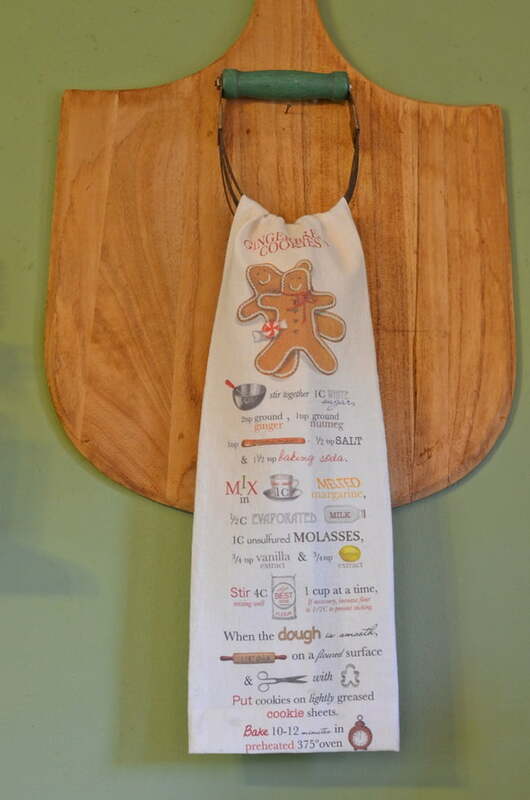 Hanging on a pizza peel is a recipe for gingerbread cookies printed on a tea towel. After the grandgirls arrive, I think we’ll make and decorate some cookies following this recipe. Oh, what fun we’ll have! 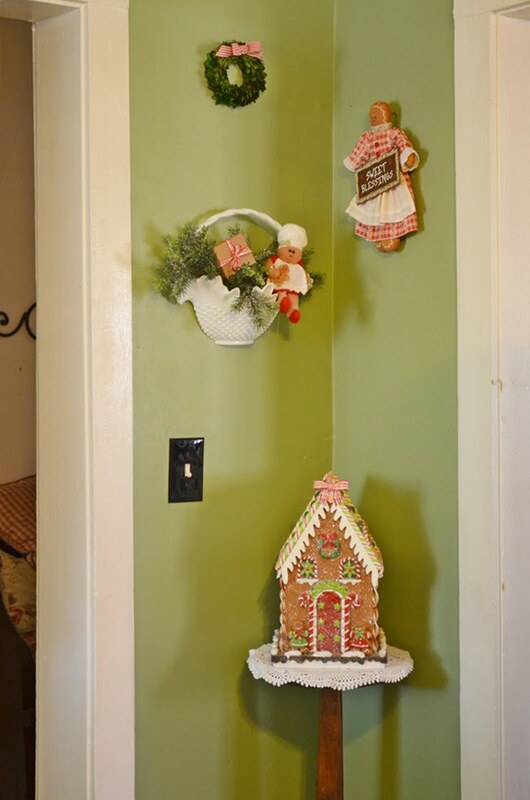 Over in the corner is another display in our gingerbread kitchen. 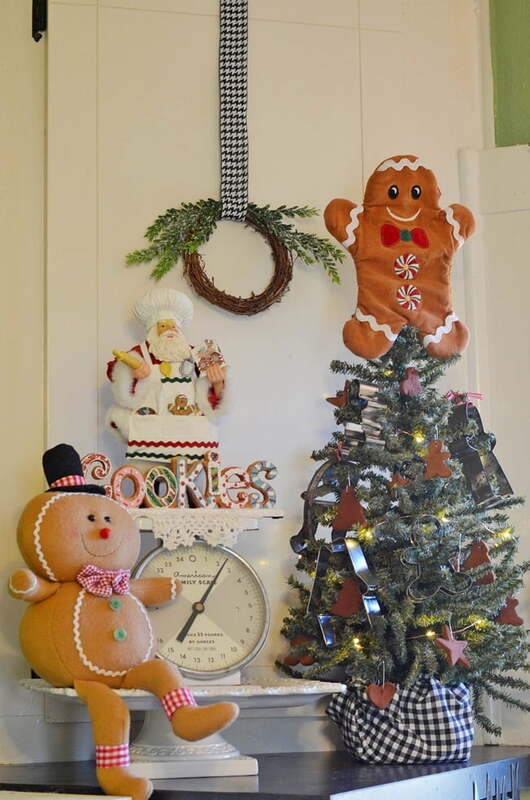 The little tree displays vintage cookie cutters along with some cinnamon applesauce ornaments that I made a few years ago. They still perfume the air with a wonderful scent. The tree topper is actually an oven mitt that fell behind the stove a few years ago. I guess you could say the gingerbread boy ran away and hid there until I found him again when we had to replace the stove! 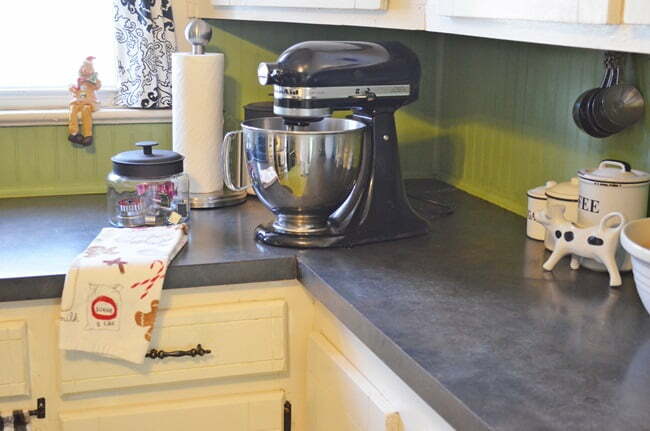 Over in this corner you can see that I’ve pulled out my mixer and more cookie cutters that I’ll be using soon. 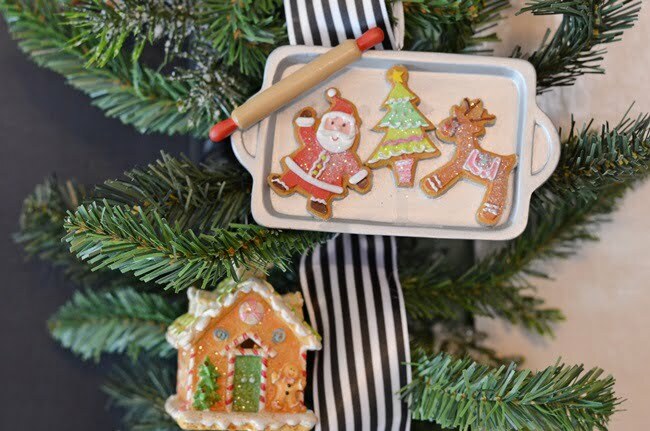 Because it’s all about the cookies and the memories we’ll be making in our gingerbread kitchen! That is the cutest!!! Everything is so cohesive but not matchy matchy. Great job. LOVE it!! 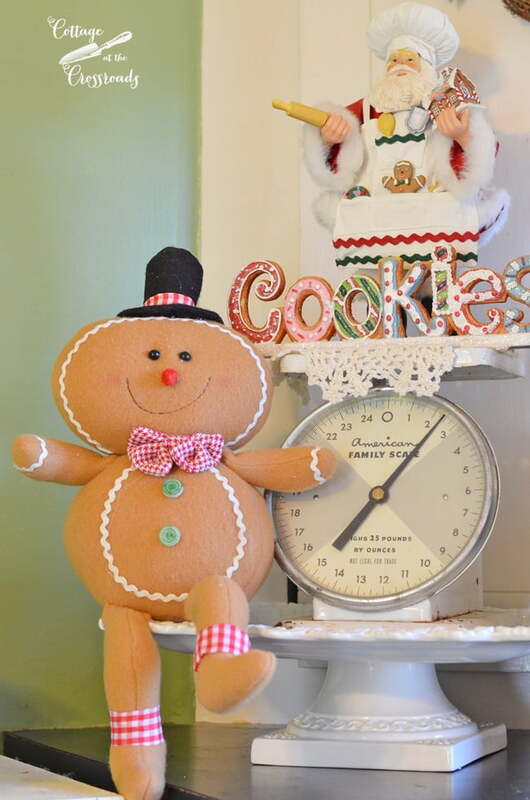 Your gingerbread kitchen makes me smile, ’cause it’s just the cutest! Oh how I love your gingerbread kitchen this year H Jane! LOVE. it’s so stinkin cute! Merry Christmas to you and Leo. I am with you! 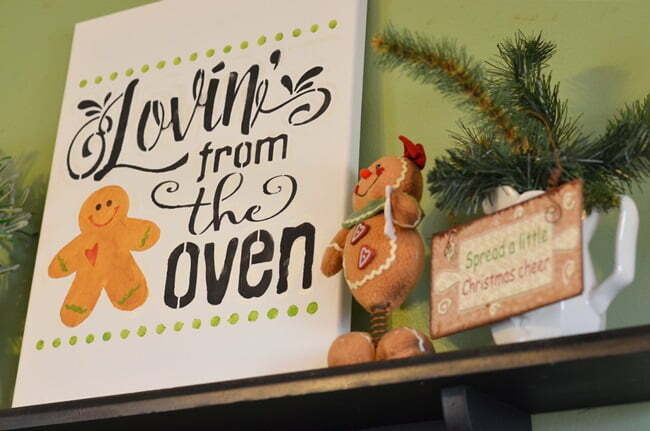 The kitchen is the heart of the home and one of the best places to decorate for Christmas! Yours is truly adorable and perfect for grandchildren. 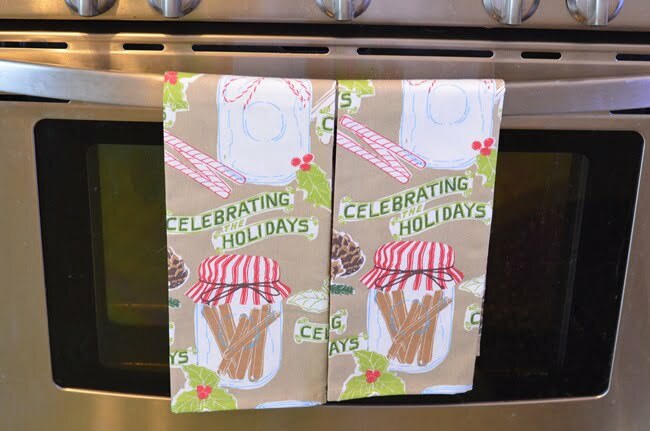 How fun to bake cookies in your kitchen! We bought ourselves a new fridge for Christmas and I can’t wait to put my vintage ceramic tree vignette on top! Love this !!!!! Certainly brings the smell and feel of Christmas just looking at the pictures !!!! You have a great talent-so many unusual things! Such a pretty kitchen. I love your color scheme. It lends itself perfectly to Christmas decor. Lovely as always! Merry Christmas! Love gingerbread folks, too! Your collection is great! Love it all! Jane, beautiful job; I have a theme of snowmen too. that bowl on porch you were afraid the wind would blow snow away, put a wad of cotton; the stuff you use to stuff pillows and dolls. that really looks like snow. love the gingerbread/ that is my sisters theme. love the seating area; beautiful furniture. don’t you have cold weather yet? its real cold here. I love this! I especially love the ones over the door. 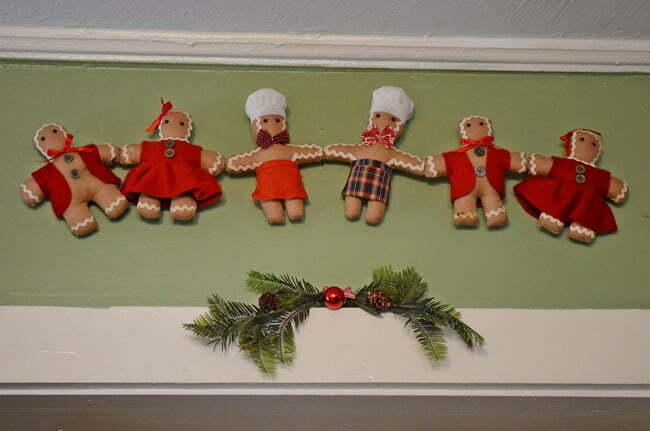 Gingerbread people do give you a warm and cozy feeling. 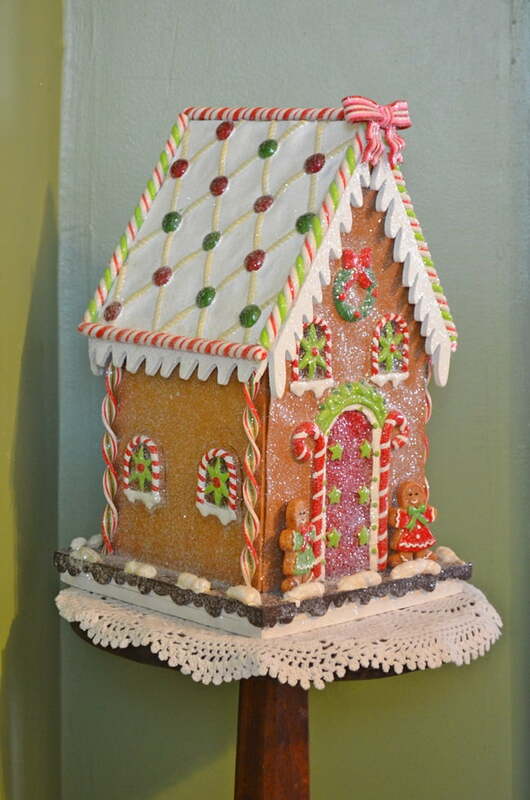 Love your Gingerbread kitchen for the holidays. Super cute. You have a great collection. Kitchen really are the heart of the home no matter big or small. Yours is really cozy and fun. Merry Christmas to you and Leo. Enjoy these last few days before the big day. 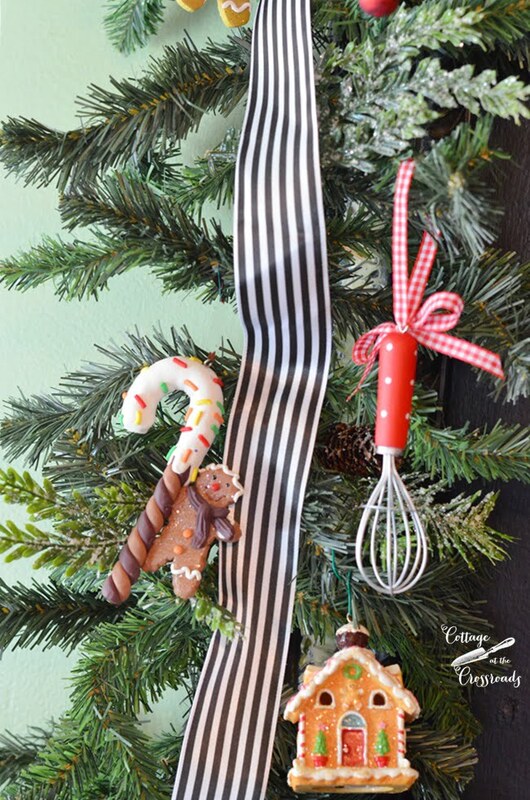 Your Gingerbread kitchen is the cutest!…I had to laugh about your cookies plate…I have done something similar! Love that Pork Chop!! Merry Christmas to you and your family….xoxo’s to Leo too! 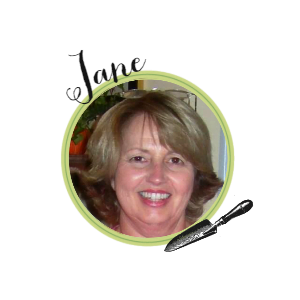 My mom would like your gingerbread kitchen and like you, bake memories with her grandchildren and now great grandchildren. I loved our Christmas kitchen growing up and baking with my mom and sister.